There were 14 salmon weighed in at the Waimakariri River Salmon Fishing Contest today. What was the biggest Salmon from the comp? I wasn’t at the Rangers Comp yesterday but apparently there were two salmon caught at the mouth about 30 minutes before the end. One was just over 4kg and the other just under. There was a lot of sea lettuce making it difficult to fish. I wanna know something – When will the Mak’s main run come? Or has it been (right at the start in dec/jan)? In a not so good season you have to work hard for every fish! This salmon was caught at the mouth of Canterbury’s Waimakariri River on 7th March 2015. Although the fish are smaller this season they are actually harder to catch because there are fewer of them. The main run of salmon in the Waimakariri River is in mid to late March. However this 2014/2015 season has been a poor one. It is a poor season in two respects; the numbers of salmon returning are very low, and secondly the salmon are small and skinny. When the salmon are small and skinny the numbers are always well down too. Many anglers are unaware that the difference between the numbers of salmon returning in a good season to that of a poor season is quite large. In a good season there may be as many as twenty times as many fish entering the rivers for anglers to catch. The salmon are small because the numbers of sprats and krill, the species which salmon mainly feed on at sea, have been noticeably down this summer. This has also effected yellow-eyed penguins which have been starving. Early season fish weights are a good pointer to the prospects for the season ahead. If you look at the early season salmon weights for fish caught by Rakaia Hut Owners, in their competition. The heaviest fish caught weighed 7.97kg (17.5 pounds), caught on 18 December 2014. The average weight has been 5.54kg (12.2 pounds). Up to the beginning of March there had still been no fish weighed in heavier than 7.97kg. By way of comparison in the 1983/84 salmon angling season there were many big salmon landed. A 16kg (35 lbs) fish won both the Rakaia and Rangitata fishing competitions that year. There were reports of even bigger salmon weighing over 20kg being taken during the 1983/84 season. One salmon was weighed in at 18.4kg (40.9 lbs), 117cm, it was a tagged fish landed at Kowhai Flats in the Rakaia River. 1993/1994 was also a very good season. 1999/2000 was a shocker. In other words it is a poor season this time around. The salmon are small and there are far fewer of them. Many anglers I know who usually catch quite a few haven’t even caught one. It comes down to conditions at sea. Salmonids grow big quickly if they have a good supply of food and the water temperature is to their liking. You can see a good example of this by the huge size of the trout and salmon caught down at the Twizel Canals where they get plenty of free food. Conversely they grow slowly and are a lot smaller if they can’t find much to eat. A good example of this can be found in Lake Coleridge where the landlocked salmon are small and skinny because there isn’t much for them to eat. Next summer, or perhaps the one after that, the salmon will be bigger and there will be a lot more of them for anglers to catch. Still some anglers will catch fish – good season or not. Couldn’t agree with you more mate. Well said. Quick question,do you know where these salmon that exit our rivers and live in the sea go before returning to spawn ? It is reasonable to assume that they are going to follow the most readily accessible food supply. But they don’t like warm water which is a large part of the reason salmon have not become established in the North Island. According to New Zealand King Salmon chief executive Grant Rosewarne, warm sea temperatures at the company’s Waihinau Bay farm, in Pelorus Sound, had contributed to the deaths of a large number of salmon. Rosewarne would not say for commercial reasons how many salmon had died, or how many fish were at the farm, but said the mortality rate was a “multimillion-dollar problem to solve”. Water temperatures at the Waihinau Bay farm had stayed above 18 degrees Celsius for three months, Rosewarne said. “I don’t think we’ve ever had it quite as bad as this year.” King salmon cannot regulate their body temperature. They function best when water temperatures are between 12C and 17C. So I’m picking they won’t be headed very far north once they leave the Rakaia and Waimakariri Rivers. Some years sea water temperatures are warmer than others. Temperatures in the deep ocean are colder and more constant than surface temperatures. So salmon may go deeper when the surface water is too warm. However they also have to eat while at sea so will have to move to where the food supply is in the water column. Sea temperatures in Canterbury have been warmer in the last few years. A snapper was caught recently at Birdlings Flat, and yellowtail kingfish have been taken this summer in Otago Harbour. There have also been a lot more kahawai around the Canterbury coastline. These species are generally associated with warmer waters further north. http://decapoda.nhm.org/pdfs/30252/30252.pdf Some info on Krill. Interesting that in the article on what salmon eat at sea that they say the really good body weights are achieved in an extended shoalling for krill season. I remember the krill were particularly abundant 2 years back. Be interesting to see if things bounce back next year. Thanks for posting a link to that Fisheries Report about Munida gregari (red krill). There is certainly thought to be a link between the abundance, or scarcity, of krill in the sea off Canterbury and Otago, and the size and number of returning salmon to our South Island east coast rivers. I remember once fishing for big sharks off Otago Peninsula. The dark blue/black sea water was laced with enormous clouds of dark maroon coloured red krill stretching as far as the eye could see in every direction. The volume of which was just unimaginable. The krill were being preyed on by vast schools of barracouta and kahawai. The sky was full of seabirds. It was an incredible sight. In the worst salmon season on record in 2001 red cod catches off Canterbury and Otago also collapsed. Salmon returns at that time were poor in all the east coast rivers which shows the problem was at sea. Part of the allure of salmon fishing is anticipation of the season ahead. It takes patience, skill, and knowledge to catch salmon no matter how many are running our rivers in any given season. Any day you catch a salmon is a day worth celebrating. Ross Millichamp, of North Canterbury Fish & Game, regarded as one of our most knowledgeable salmon anglers, once said, “In Canterbury, each season, perhaps 100 anglers catch as many salmon as all the other salmon anglers put together.” In my experience I would say Ross is quite correct! I would like to point out to some of our readers, who may be unaware, there have been days in the mid 90s when over 100 salmon a day have been landed at the mouths of the Rakaia and Waimakariri Rivers. Sometimes this has occurred for days at a time. Most of the fish caught were well over 9kg (20lbs). Many of the salmon landed weighed around 16kg (35lbs) – some were even heavier. The main Waimak run is on NOW!! 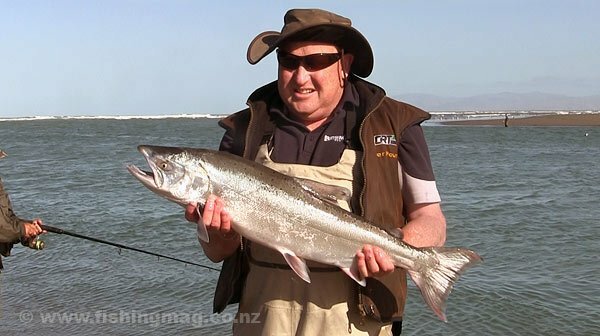 Have just added a picture gallery to our Rakaia Salmon Fishing page with 20 photographs by Charles Smith. Will add a second gallery to the same page tonight or tomorrow. You may be unaware that clicking on forum pictures will enlarge them provided they are bigger than the thumbnail picture. the problems with this salmon season are 1 it was late and there are still fish arriving. 2 very few fish survived the 2011 run because of the quakes. the good news is that there have been a lot of 2year at sea fish which according to niwi usually means a good number of 3year at sea fish the following season. good 1st spawning count on the rakaia 1200 fish. also 180,000 smolt to be released this winter split between the rakaia and mak. personally i went 9 weeks between my first fish and the 2nd, then got 6 in 11 days most in april. will be out looking for a may fish this coming week.